Is It OK To Run Down Motorcyclists? You are here: Home / Rider News 2010 / Is It OK To Run Down Motorcyclists? Here at Right To Ride we keep in contact with individuals, organisations and blogs from around the globe, all who have a passion for motorcycling and riders rights. Minutes of a Motorcycle Addict – is one of these, based in Norway but with contacts around the world. The latest blog informs us that Norwegian riders are mad as hell after a car driver was acquitted in court for running down and seriously injuring a motorcyclist. The Norwegian Motorcyclists’ Union NMCU are on the case to demand that the State Attorney appeals the verdict. Issues like these need highlighting and maybe it’s time to think outside the norm to form a loose association of like- minded riders and point of contact available to riders around the world, who have something worthwhile to say about motorcycling to highlight issues in their countries that could impact in other countries. According to the news sites reporting on the case, the court acquitted the female car driver by a 2 to 1 vote. Two of the judges claimed the driver had taken due care despite hitting the young motorcyclist, who had amongst other injuries, shattered his foot and spent two weeks in hospital. The third judge said that these facts were not compliant with “taking due care” and wanted the car driver jailed and fined. Unfortunately, he was voted down. In effect this verdict says that if the car driver had hit another car, she would have been jailed and fined. But not when she – or any other car driver hereafter, if the verdict stays as it is – hits a motorcyclist. Naturally, the Norwegian Motorcyclists’ Union, NMCU is on the case. Norwegian riders are mad as hell, supporting NMCU’s demand for the State Attorney to appeal the verdict. Because it’s NOT OK to run down motorcyclists. Write your supportive comment and I’ll pass it on to NMCU to show them that riders all over do care and support their work on this case! Two of the three judges in Tønsberg District Court acquitted a car driver who did not yield to a young motorcyclist. The reason for this was the fact that the female car driver hit a motorcycle, not a car. The Prosecutor had demanded for the driver to be jailed for 30 days, two years revocation of the driving licence, redress and trial costs to be paid by her. But the two judges Ms Grete Müller and Ms Berit Follesø did not agree, out-voting the third District Court judge Mr Didrik Behrens. The accident happened in an intersection one Thursday morning in June 2009. According to the trial records, it was heavy traffic in both directions on the main road. The young motorcyclist was riding his bright red motorcycle in a small pocket between the cars in the moving queue that had formed. He was riding in the middle of his lane in the same speed as the queue, approximately 60 km/h. In court the car driver claimed she didn’t see the motorcycle because it’s so narrow and that it was obscured by a signpost in the intersection. The rider had his ankle crushed, his elbow broken and sustained a number of injuries after the car hit him. He was hospitalized for 13 days and had to be on a sick leave for two months. In the District Court, the two judges concluded that the car driver took all the due care one could expect in the situation. Hence, she was acquitted. The Norwegian Motorcyclists’ Union warns that the reason for the acquittal is downright dangerous, if the verdict stays as it is. The two lay judges based their stance on the claim that the car driver did all she could to take due care, and that the accident happened because a motorcycle is harder to spot than a car. With this, the majority of the court is actually claiming that the Road Traffic Act’s requirement for taking due care may be graded, which in NMCU’s view is an extremely dangerous signal to send to Norwegian car drivers. Collisions between cars and motorcycles account for half of all motorcycle related accidents in Norway. 10 to 15 riders are annually killed and more than 200 injured in such accidents. In 1999, the Institute for Transport Economics (TØI) issued a report on behalf of the Norwegian Public Road Administration (NPRA) which documented that in 8 out of 10 such collisions, the car driver is to blame for the accident. 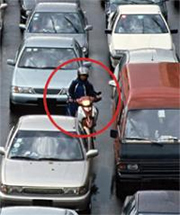 The more common situation is where the car driver fails to yield for, or in other ways fails to observe, the motorcycle. The problem is NOT that motorcycles and mopeds are «invisible». In the report from TØI it is shown that motorcycles are way above the threshold of what is actually possible to sense. What may be the case, though, is that the car drivers are not mentally prepared to look for two-wheelers. In the report, TØI recommends the NPRA to create more consciousness among car drivers with regard to motorcycles, thus “training” them to spot motorcyclists. If the verdict in Tønsberg District Court stays as it is, it will send a signal to the road users that you will be let off the hook if you crash with something smaller than a car. The NMCU has therefore asked the Prosecutor and State Attorney to appeal the verdict. 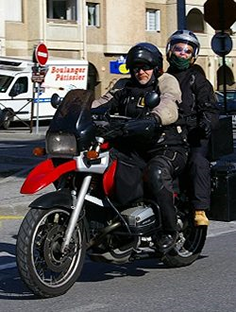 News has reached us from Minutes Of A Motorcycle Addict website that the female car driver who was acquitted in the district court in March is now sentenced by the appeal court to do jail time and lose her drivers’ licence. The District Attorney appealed the verdict, and the Agder Appeal Court sentenced the car driver to 18 days unconditional jail time as well as loss of drivers’ licence for 6 months.